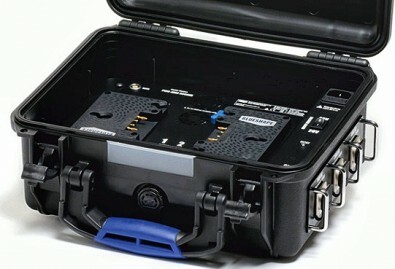 Blueshape said the new batteries come in 98, 196 and 292 watt-hour versions and are designed to deliver up to 20 amps. All feature the Granite Link Wi-Fi remote battery monitor. New chargers include Three-Stud and V-Lock versions. The Three-Stud model charges two independent 100 watt batteries in a fast turnaround. A 290-watt battery is charged in about 3.5 hours. Charging is controlled to avoid stress, overheating and overcharging. Operation is fan-less and quiet. Also available is the rugged Power Station Mini for 14, 28 and 48-volt three-sure and V-Lock batteries. A duel charger is embedded in the case.